With a look and style all of its own the huge, 10′ x 6’6 Shire Guernsey Double Door Shed will be a structure that looks very impressive in your garden and it is going to provide you with just an incredible amount of room to make use of. 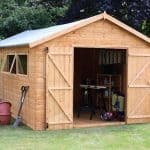 This is a shed which is so large that if you do use it as storage then you can not only keep your garden items tidy, but even have room to declutter the house a little as well. The size and the style of the shed allows you to use this as a workshop and if you find working in here on a summer’s day gets a little too hot then just open up those large windows and let in some fresh air. To make this a shed which is going to not only offer lots of space, but also last for many years, top of the line materials have been used. The wall cladding is high quality tongue and groove shiplap cladding. Even the floor is made with tongue and groove boarding to give it a lot of strength. The impressive apex roof has been chosen not only because it looks very appealing, but also because it will stop the rain from getting inside and wrecking your belongings. 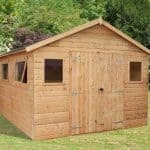 The 10′ x 6’6 Shire Guernsey Double Door Shed really is one huge, impressive looking structure that is going to serve you incredibly well as either a place for a whole lot of storage or even as an area to work. 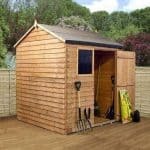 One thing we have to tell you right away is that despite the 10 x 6’6 in the name of this shed actually takes up a bit more space than that with the width being 7 feet 3 inches and the depth, 11 feet so this is something to take into consideration if you plan to build this snugly next to a wall or tree. Inside the shed though this amount of room is just amazing and we are sure you are going to be very happy with the room that it gives you. The impressive floor space is joined with some very good headroom as along the ridge there is 6 feet 11 inches along the eaves there is 5 feet 9 inches. We absolutely love the apex roof that is on this shed. To start with it has a very nice overhang just above the door. This is great if it is pouring down with rain and you need to get into the shed, plus it also looks fantastic. The roof is made up with 11 mm solid sheet boarding we have seen Shire use this type of boarding before and we have no issue with it as it is strong enough and it does help keep the overall cost of the shed down. On top of this boarding we have some very durable felt that can take rain, snow or even baseball sized hailstones. With the shed being as large as it is we thought that as the price was so low, Shire might have cut a couple of corners with the cladding. Well this is not the case at all as the cladding is very high quality. 12 mm tongue and groove shiplap cladding made from high quality softwood has a really attractive look to it, but it is also very efficient when it comes to keeping away the rain. Like the cladding the frame is made from the same kind of softwood and Shire have actually managed to put in a very robust frame, considering the price. This 34 mm x 34 mm frame will be able to keep its shape and stay strong for the whole life of the shed which will easily be a couple of decades if you take care of it. We know that to some people the frame may not seem like a big deal, but the frame is what is going to make sure your shed lasts for many years and we can tell you with confidence this is one very impressive frame. The floor was what really surprised and impressed us most about this shed. We assumed that Shire would be using the same 11 mm solid sheet boarding which is used for the roof for the floor. This though is not the case and we are very pleased as they have used 12 mm tongue and groove flooring which of course looks very good, but it also means the flooring can take a lot of weight and not feel cheap while you are walking around the shed. All of the wood on the 10′ x 6’6 Shire Guernsey Double Door Shed will be dip treated which will be perfect for when the shed is being delivered and also for while you are building it. 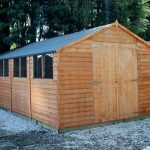 Just be sure to treat the shed once you have built it and then remember to do it on an annual basis so the wood will keep on looking great. With the shed you will get a one year warranty that will cover you against things like rot or if something goes wrong with the materials. The double doors on this shed are just amazing and when opened the huge space before you really is impressive. The height of the door is 5 feet 7 inches, but the real appeal of these doors is the width which is 4 feet 6 inches wide. You will have no trouble getting things like a large lawn mower or even furniture like chairs, tables, shelving and even benches if you plan on doing some work here. To keep the doors closed there is a pad bolt and to keep them in their place each one has three hinges. One of the main features of the shed is the windows. The shed comes with two windows which can be opened and these windows are made with horticultural glass which is very strong and it also looks very high quality. When constructing the shed, you can actually decide where the windows will go. You can have them both on one side which is ideal if your shed does have to go close to something, or you can have one on either side. 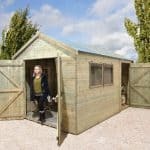 We are sure that anyone who buys this shed will be very happy with how secure and strong the shed feels. As long as you remember to close those windows and make sure the door is securely shut then you should have no security concerns at all. If you do have ideas about using this as some kind of workspace or if you have plans to keep some more expensive items in here then you will most certainly want to cover up those windows. They may look great and are a huge feature of the shed, but they do not allow for much privacy. We have a few ideas for ways that you can give the shed a little touch of your own personality. One way would be to decorate the outside of the shed with some plants, baskets or even a bird feeder. As you need to treat the shed anyway, you could have a look at the different coloured wood treatments that are out there. The pad bolt that comes with the shed will work wonders at keeping that door shut, but to really keep this locked up, you are going to have to buy a padlock. To tell the truth as far as extras go this is not really a big deal and will not cost you much over a pound and require just a couple of minutes of your time. Shire have really managed to make one not only large, but high quality shed here for a very reasonable price. These type of materials as long as you look after them will last you for many years. 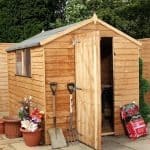 A yearly treatment and a little TLC every now and again will see this shed be part of your garden for as long as you need it to be. Nearly 11 x 7 is the size of this shed and that is just an incredible amount of storage room. You could put all you have inside here and there would probably still be a few spare feet to make use of. While this is a two person job, actually the shed even though it is huge is not that hard to build. This is because of its modular design so you should have this all built in around 2-4 hours. 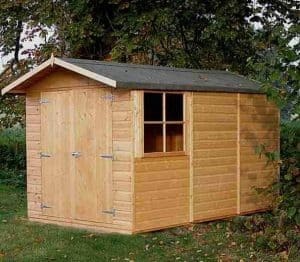 At under £500, you really are getting one amazing deal here considering the size and the quality of the shed. Final Thoughts: Wow is what we feel best sums up this enormous shed. 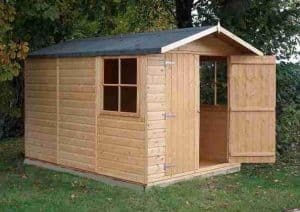 The 10' x 6'6 Shire Guernsey Double Door Shed before you even know how cheap it is, is a shed which piques your interest because of its size which let us tell you the pictures really do not do justice, the nice looking design and how sturdy and well made it feels when you touch it. Then when you learn that this is actually under £500, you really cannot hit the buy button fast enough. 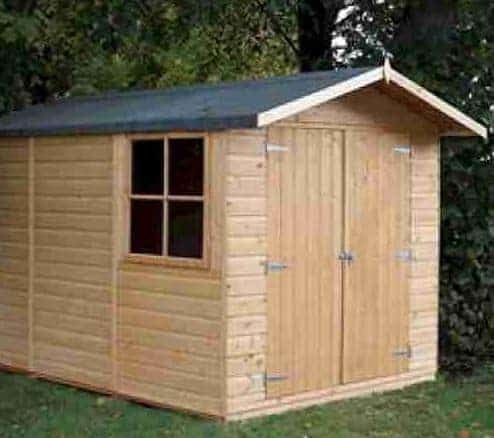 If you need a lot of storage space then this is a shed which we highly recommend you look into.